The Hulahula River flows north out of Alaska's Brooks Range mountains, through the Arctic Coastal Plain and into the Beaufort Sea. Its entire length is within the Actic National Wildlife Refuge, or ANWR, and most of it is within designated wilderness. 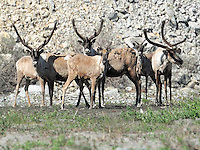 Ed & Georgia Bennett floated the river in June, 2010 and were able to capture the migration of the Porcupine Caribou Herd.